It really 'tis the season for new features here at the Court Jeweller! Today, we're featuring something I've been thinking about for a long time: the Royal Jewel Questionnaire, a post in which I get to make my friends answer incredibly tough questions about their favorite royal jewels. Today's questionnaire comes courtesy Sydney, a blogger you'll be very familiar with if you read Luxarazzi (one of the best sources out there about the royal families of Luxembourg and Liechtenstein). Sydney also runs a great blog called Confessions of a Castleholic, which chronicles her visits to various schlosses, chateaux, and palaces. I'm guest posting about my favorite castles over at Castleholic today, so when you're done reading through part one of Sydney's questionnaire, head over there and check it out! 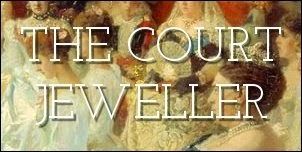 And stay tuned tomorrow here at the Court Jeweller for more of Sydney's answers to the really tough royal jewel questions! QUESTION #2: The grand ducal family of Luxembourg has an immense collection of jewelry, but if you could add one piece to their vaults, what would it be? Definitely something with rubies in it; it’s too bad they sold the rubies owned by Grand Duchess Joséphine-Charlotte a few years ago and Princess Claire’s new ones don’t really do it for me, at least not in the tiara department. As I feel they also lack medium-to-large-sized tiaras, I think I would go for something like the Duchess of Angoulême’s Ruby Tiara. ...and the Bernadotte Diamond Bracelet – having just chosen all these, I didn’t realise before how big my weakness for the Bernadotte vaults was! Considering there is so much Swedish in here, I think it’s only natural to go for the Order of Seraphim. QUESTION #4: I strongly believe that every queen should have at least five tiaras at her disposal. If you could assemble your ultimate collection of five royal tiaras, which ones would you pick? Considering that I have mentioned so many all-diamond tiaras already, I’ll go for my collection of ultimate colourful tiaras instead (because I believe a queen should have one tiara of each of the following stones at least): The Hesse Aquamarine Tiara, the Leuchtenberg Sapphire Tiara, Queen Mary's Amethyst Tiara, the Duchess of Angoulême’s Ruby as well as her Emerald Tiara. She really had the best taste in jewels! Stay tuned for Part 2 of the Questionnaire tomorrow!